5 months is finally here. 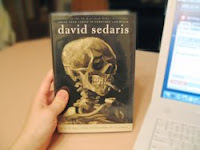 I put myself on the library waiting list for David Sedaris' "When You Are Engulfed in Flames", was #217 on the waiting list, and it is finally in my hands. Patience and forgetting I had this book on my reserve list has paid off. Those audio & book stories are terrific for keeping the little ones occupied when you have to get something done around the house. We (heart) the library. Especially in the winter when it's cold outside and warm on the couch. Anybody else with some library love to share? our family <3 the library as well. I am reading The Billionaires Vinegar thank to the local library! Can't wait to hear how it is. I've heard his books are good, but I have yet to read any. I need to get them on my list. We've been enjoying the children's Story Time every thursday at our library.